Symphony Orchestra in Prague, with the Mozart Violin Concerto No.5. 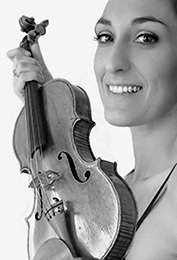 Italian violinist, Irene Abrigo started playing the violin at the age of 4 at the Aosta Suzuki School. She continued her education with Marie-Annick Nicolas, Pierre Amoyal and Corina Belcea. She had Masterclasses with, among others, Thomas Furi, Itzhak Rashkovsky, Viktor Pikayzen, Samuel Ashkenazi, Vadim Gluzman, Ivry Gitlis and Zakar Bron. Deeply convinced about the social responsibility of the art, Irene founded in 2012 POURQUOIPAS, a musical and artistic project engaged particularly in social purposes. Graduated at Liceo Classico "XXIV February" in Aosta, in 2015 she had her degree in art, literature and performance (DAMS) at the University of Turin with a thesis about Niccolò Paganini. Thanks to a generous loan Irene Abrigo is currently playing on a splendid violin by Giovanni Battista Guadagnini, Milano 1758.